Did you know that perception is nine-tenths of the law? I know. I know. The saying goes, "Possession is nine-tenths of the law." I like the perception version, though, when it comes to the customer experience. According to Wikipedia, "possession is nine-tenths of the law" means: in the absence of clear and compelling testimony or documentation to the contrary, the person in actual, custodial possession of the property is presumed to be the rightful owner. Then I think "perception is nine-tenths of the law" means: in the absence of clear and compelling testimony or documentation to the contrary, the person in actual, custodial possession of the belief or perception is presumed to be the rightful owner; it is his reality. What, then, is a perception? According to Oxford Dictionaries: perception is "a way of regarding, understanding, or interpreting something; a mental impression." There's perception, and then there's reality. Are they two different things? Not necessarily. (Note I didn't flat out say, "No.") My perception IS my reality. So, if the customer's perception is his reality, is it your reality, too? Your perception may be different. But is that OK? If there are opposing perceptions, then clearly your reality is out of alignment with your customer's. Why? Read on. How are those perceptions formed? Through expectations (brand promise, marketing, word of mouth), many of which you set, and performance (actual interactions with the brand), which is on you. So what's my point? Just that - your company may think that it's delivering a great customer experience, but instead, the customer's perception is opposite, and it prevails. Why? Because he's the customer. Because without the customer, you have no business. To confirm the discrepancy between perceptions (or in realities), we need to listen to customers through various channels. In the customer experience, the customer's perception is not only their reality but also yours. And if we're going to change perceptions, then we need to change reality. There are limitations, for sure. Is the customer always right? No. But he is the customer, and you must always do right by him. 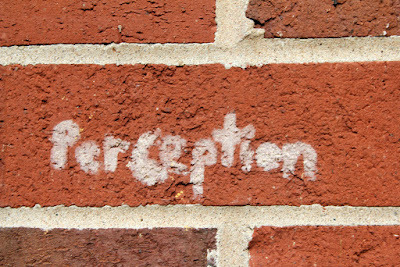 Is perception reality? I think it has to be, my reality is totally governed by the things I see and believe to be true. So I suppose our only option is to work out what our organisations can do to improve the perceptions our customers have about them. Thanks, James. I'm in agreement with you. It think it has to be. I read you posted and it made me think about a saying I learned once that said: 'True communication is the response you get'. We can think we communicate well and that we are perceived well but, in actual fact, it's the responses that we get from the world outside of ourselves that tell us the real truth and how accurate we are. I think that saying is along the same lines as "perception is reality." Communication is a great analogy - what you say and what I hear can be two totally different things. What matters in the end is what I hear. That is my reality. If I don't hear it correctly, then you've not said it properly. To your point, check out this fascinating article from the New York Times. It describes how customers' perception of time spent waiting averages 36% overall the actual mark. Thanks for sharing that, Jeff. Interesting stat. And yet, it's their reality, right. It seems to highlight the emotional aspect, the feeling part. "I waited in line 5 minutes but it felt like 10 or 15." It depends on who/what you wait for and the perceived value of him/her/it. If one waits for his lover,even 1 hour looks 10 minutes. If one waits for a junior associate or ( for wife at shopping malls), 10 minutes look 1 hr. Good point, Ari. Your perception is your reality, for sure. Great analogies. A Classic still applicable today! Great read! I just completed a blog posting yesterday that seems to complement your article -> "Exceptional Service: Extra Toppings without Sacrifice"